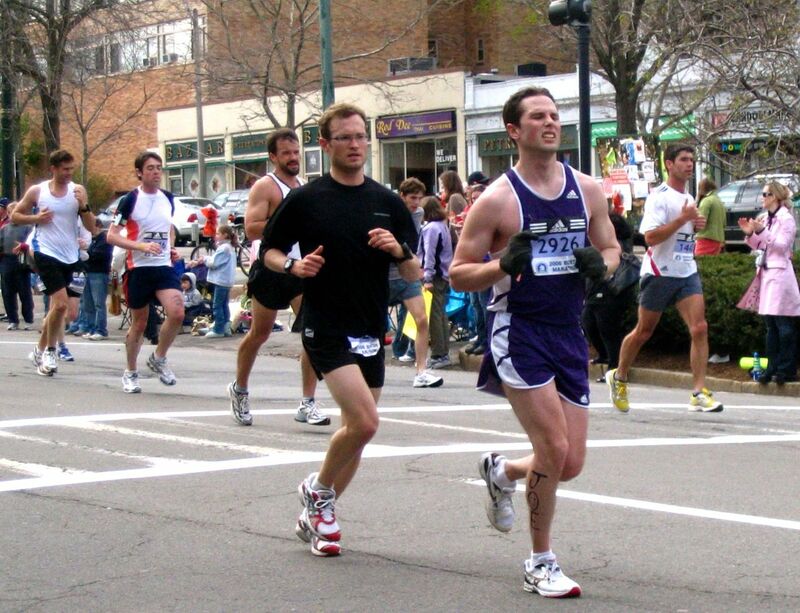 Did you know that marathon runners are the human equivalent of a “perfect storm” when it comes to catching colds? 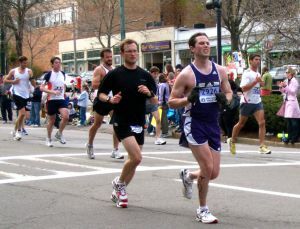 A marathon runner could not possibly drink enough water to offset the water loss during the running of 26.2 miles, so they are dehydrated. When the body’s cells are starving for water, all our systems go out of whack.. Anyone engaged in strenuous activity will likely breathe through his/her mouth for a significant amount of time since the lungs were struggling to take in as much oxygen as possible. More germs enter through the mouth than the nose, because the mouth doesn’t have cilia and mucous membranes similar to the nasal passages, which trap microbes before they go down to the lungs. You can see where this is going… given suppressed immunity, thirsty cells not functioning properly, and germs gaining easy entry into the body, it makes sense that someone like that would be susceptible to a catching a cold. I learned about this “perfect storm” last fall at a seminar by Nick Hall PhD on nutrition and chronic inflammation. Break a sweat. Raising your body temperature makes it a less friendly environment for germs. In Chinese medicine, the first line of defense against a cold is to work up a sweat to “release the exterior” or kick out the pathogen. Don’t skip the gym if you can help it. 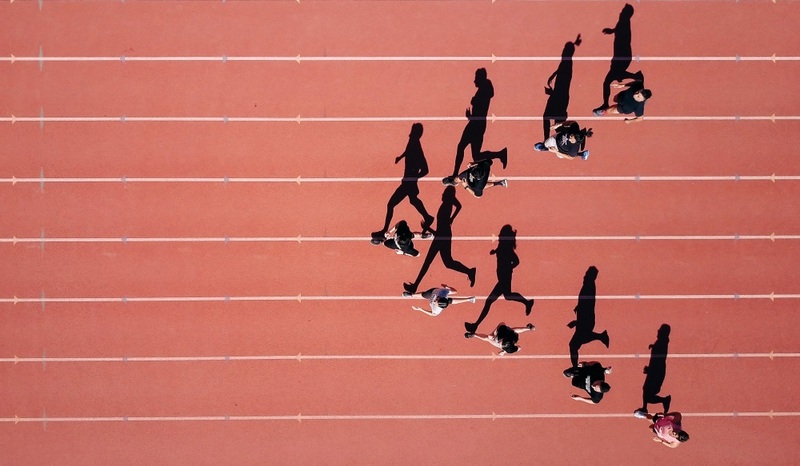 It’s actually beneficial to keep moving because the lymphatic system, like our veins, doesn’t have a pump (a.k.a the heart) to push the fluid through your body. Lymph circulation is dependent on muscle contraction so exercise provides double benefits of increasing your temperature and promoting the circulation of lymphatic fluid to get those white blood cells to where they need to go. Take some Vitamin C. It turns out that Vitamin C seems to help marathon runners from catching a cold, although it is not proven whether it makes much of a difference as a daily supplement. It may also reduce the duration and intensity of a cold so why not take it when it actually seems to have the most benefit for your body? Breathe through your nose. When you’re stuck in a crowded subway train and someone’s hacking up a lung, don’t start breathing through your mouth to avoid the germs. Purse your lips and breathe normally. The lining of your nasal passages is your first line of defense against disease, so use it. It wouldn’t hurt if you picture the germs bouncing off your wei qi (defensive layer of qi) either. Drink more water. It should be obvious, but most of us stay oblivious to the effects of dehydration because we simply don’t remember to drink enough water. When you’re sick, hydrating makes it easier for toxins to be flushed out of your body apart from helping your cells function properly. 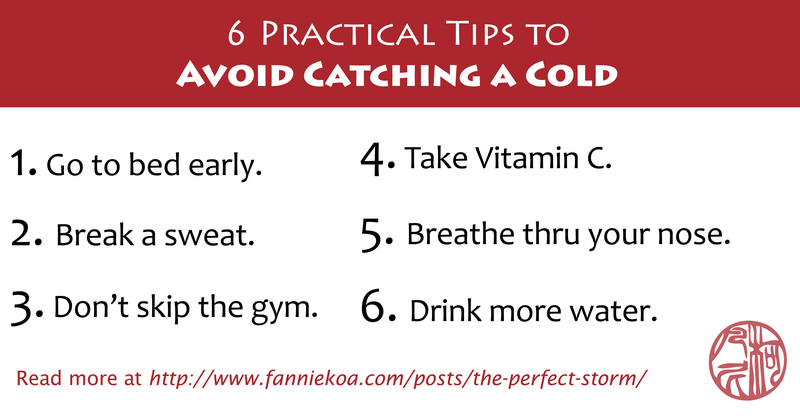 So don’t be a perfect storm for catching a cold. And keep up with your acupuncture treatments to build a stronger immune system. An energetically balanced body is a healthy body, and germs will simply have to evacuate it for a less hostile environment.